^ 2.0 2.1 2.2 Canup, R.; Asphaug, E. Origin of the Moon in a giant impact near the end of the Earth's formation (PDF). Nature. 2001, 412 (6848): 708–712 [2011-12-10]. Bibcode:2001Natur.412..708C. PMID 11507633. doi:10.1038/35089010. （原始内容 (PDF)存档于2010-07-30）. ^ 3.0 3.1 Mackenzie, Dana. The Big Splat, or How The Moon Came To Be. John Wiley & Sons. 2003. ISBN 978-0-471-15057-2. ^ 4.0 4.1 4.2 4.3 Wiechert, U.; 等. Oxygen Isotopes and the Moon-Forming Giant Impact. Science (Science (journal)). October 2001, 294 (12): 345–348 [2009-07-05]. Bibcode:2001Sci...294..345W. PMID 11598294. doi:10.1126/science.1063037. ^ Daniel Clery. Impact Theory Gets Whacked. Science. 11 October 2013, 342: 183. Bibcode:2013Sci...342..183C. doi:10.1126/science.342.6155.183. ^ 6.0 6.1 Binder, A. B. On the origin of the Moon by rotational fission. The Moon. 1974, 11 (2): 53–76. Bibcode:1974Moon...11...53B. doi:10.1007/BF01877794. ^ Daly, Reginald A. Origin of the Moon and Its Topography. PAPS. 1946, 90 (2). JSTOR 10.2307/3301051. doi:10.2307/3301051. ^ Hartmann, W. K.; Davis, D. R. Satellite-sized planetesimals and lunar origin. Icarus. April 1975, 24 (4): 504–514. Bibcode:1975Icar...24..504H. doi:10.1016/0019-1035(75)90070-6. ^ Cameron, A. G. W.; Ward, W. R. The Origin of the Moon. Abstracts of the Lunar and Planetary Science Conference. March 1976, 7: 120–122. Bibcode:1976LPI.....7..120C. ^ 10.0 10.1 Halliday, Alex N. Terrestrial accretion rates and the origin of the Moon. Earth and Planetary Science Letters. February 28, 2000, 176 (1): 17–30. Bibcode:2000E&PSL.176...17H. doi:10.1016/S0012-821X(99)00317-9. ^ 13.0 13.1 Stevenson, D. J. Origin of the moon–The collision hypothesis. Annual Review of Earth and Planetary Sciences. 1987, 15 (1): 271–315. Bibcode:1987AREPS..15..271S. doi:10.1146/annurev.ea.15.050187.001415. ^ Pahlevan, Kaveh; Stevenson, David. Equilibration in the Aftermath of the Lunar-forming Giant Impact. EPSL. October 2007, 262 (3-4): 438–449. Bibcode:2007E&PSL.262..438P. arXiv:1012.5323. doi:10.1016/j.epsl.2007.07.055. ^ Daniel Herwartz, Andreas Pack, Bjarne Friedrichs, Addi Bischoff. Identification of the giant impactor Theia in lunar rocks. Science. 2014-06-06, 344 (6188): 1146–1150 [2018-04-02]. ISSN 0036-8075. doi:10.1126/science.1251117 （英语）. 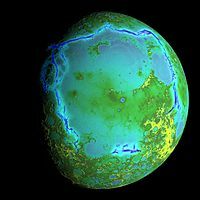 ^ Traces of another world found on the Moon. BBC. 2014-06-06. ^ F. Moynier, F. Albarède, G.F. Herzog. Isotopic composition of zinc, copper, and iron in lunar samples. Geochimica et Cosmochimica Acta: 6103–6117. [2018-04-02]. doi:10.1016/j.gca.2006.02.030. ^ Frederic Moynier, Pierre Beck, Fred Jourdan, Qing-Zhu Yin, Uwe Reimold, Christian Koeberl. Isotopic fractionation of zinc in tektites. Earth and Planetary Science Letters: 482–489. [2018-04-02]. doi:10.1016/j.epsl.2008.11.020. ^ D. Ben Othman, J.M. Luck, J.L. Bodinier, N.T. Arndt, F. Albarède. Cu–Zn isotopic variations in the Earth’s mantle. Geochimica et Cosmochimica Acta. [2018-04-02]. doi:10.1016/j.gca.2006.06.201. ^ Lisse, Carey M.; 等. Abundant Circumstellar Silica Dust and SiO Gas Created by a Giant Hypervelocity Collision in the ~12 Myr HD172555 System. Astrophysical Journal. 2009, 701 (2): 2019–2032. Bibcode:2009ApJ...701.2019L. arXiv:0906.2536. doi:10.1088/0004-637X/701/2/2019. ^ Rhee, Joseph H.; Song, Inseok; Zuckerman, B. Warm dust in the terrestrial planet zone of a sun-like Pleiad: collisions between planetary embryos?. Astrophysical Journal. 2007, 675 (1): 777–783. Bibcode:2008ApJ...675..777R. arXiv:0711.2111v1. doi:10.1086/524935. ^ Song, Inseok; 等. Extreme collisions between planetesimals as the origin of warm dust around a Sun-like star. Nature. 21 July 2005, 436 (7049): 363–365. Bibcode:2005Natur.436..363S. PMID 16034411. doi:10.1038/nature03853. ^ 26.0 26.1 Jones, J. H. Tests of the Giant Impact Hypothesis (PDF). Lunar and Planetary Science. Origin of the Earth and Moon Conference. Monterey, California. 1998. ^ Taylor, Stuart R. The Bulk Composition of the Moon (PDF) 37. Lunar and Planetary Science. 1997 [2010-03-21]. Bibcode:2002M&PSA..37Q.139T. ^ Galimov, E. M.; Krivtsov, A. M. Origin of the Earth-Moon System (PDF). Journal of Earth Systems Science. December 2005, 114 (6): 593–600 [2011-12-10]. Bibcode:2005JESS..114..593G. doi:10.1007/BF02715942. ^ Scott, Edward R. D. Oxygen Isotopes Give Clues to the Formation of Planets, Moons, and Asteroids. Planetary Science Research Discoveries (PSRD). December 3, 2001 [2010-03-19]. Bibcode:2001psrd.reptE..55S. ^ Nield, Ted. Moonwalk (PDF). Geological Society of London: 8. September 2009 [2010-03-01]. （原始内容 (PDF)存档于2011-06-05）. ^ Koppes, Steve. Titanium paternity test fingers Earth as moon’s sole parent. Zhang, Junjun. The University of Chicago. March 28, 2012 [August 13, 2012]. ^ 37.0 37.1 37.2 Belbruno, E.; Gott III, J. Richard. Where Did The Moon Come From?. The Astronomical Journal. 2005, 129 (3): 1724–1745. Bibcode:2005AJ....129.1724B. arXiv:astro-ph/0405372. doi:10.1086/427539. ^ Halliday, Alex N. A young Moon-forming giant impact at 70–110 million years accompanied by late-stage mixing, core formation and degassing of the Earth. Philosophical transactions. Series A, Mathematical, physical, and engineering sciences (Philosophical Transactions of the Royal Society). November 28, 2008, 366 (1883): 4163–4181. Bibcode:2008RSPTA.366.4163H. PMID 18826916. doi:10.1098/rsta.2008.0209. ^ Than, Ker. Did Earth once have multiple moons?. New Scientist (Reed Business Information Ltd). May 6, 2008 [2011-12-10]. ^ Dambeck, Thorsten. Retuschen an der Entstehungsgeschichte des Erdtrabanten [Retouches on the genesis of Earth's moon]. 11 September 2012 [23 September 2012]. （原始内容 (HTML)存档于11 September 2012） （德语）. ^ Mitler, H. E. Formation of an iron-poor moon by partial capture, or: Yet another exotic theory of lunar origin. Icarus. 1975, 24 (2): 256–268. Bibcode:1975Icar...24..256M. doi:10.1016/0019-1035(75)90102-5. ^ NASA Lunar Scientists Develop New Theory on Earth and Moon Formation. NASA Press Release (NASA). 2012-10-30 [2012-12-05]. R. Canup and K. Righter, editors. Origin of the Earth and Moon. University of Arizona Press, Tucson. 2000: 555 pp. Shearer, C. K.; 15 coauthors. Thermal and magmatic evolution of the Moon. Reviews in Mineralogy and Geochemistry. 2006, 60 (1): 365–518. doi:10.2138/rmg.2006.60.4. Galimov, Erik M., and Krivtsov, Anton M. Origin of the Moon. New Concept. Geochemistry and Dynamics. De Gruyter. , Berlin 2012, ISBN 978-3-11-028640-3. Dana Mackenzie, The Big Splat, or How Our Moon Came to Be, 2003, John Wiley & Sons, ISBN 978-0-471-15057-2. G. Jeffrey Taylor. Origin of the Earth and Moon. Planetary Science Research Discoveries. December 31, 1998.